This entry was tagged Anky Van Grunsven, Rolkur, Spanish Riding School, SRS, Ulrike Thiel. Bookmark the permalink. OH no! Is this true? This is obscene! I spent my childhood revering the School. Wow. Are you effin’ kidding me? Anky influences the SRS? So, so sad. NOOOOO!!!!! Is there any sense left in the horse world?? Follow the money. I had heard others being critical of the school, so it doesn’t surprise me but it still saddens me. But the riders are government employees, secure, having benefits, etc. as well as working in one of the grandest traditions of horsemenship, but it isn’t the big money world of the FEI riders/trainers. Many train on the side for competition, it is inevitable that they would choose money and techniques that earn it in the outside world. Maybe this will cause enough furor to have some house cleaning. Let me clarify that, the management of the school was privatized, so technically the riders are now employees of the private company, and paid through them. But since the school must now make a profit, and the CEO isn’t someone who came up through the school but is a business person brought over from somewhere else, the money is the main thing now. But it is always about the money. Being a priceless cultural treasure and the repository of an oral tradition of over 400 years of classical horsemanship must give way to profit. So prior to this change, was the SRS operated by government? I am in no way in favour of allowing profit to have a role in such an important institution, but Austria’s economy is greatly tied into that of the rest of the EU which means it has been suffering for some time. I can picture a government faced with a lot of priceless cultural treasures that cost a lot of money and needing to make some of them earn their keep, so to speak. I don’t know to resolve this, I can only imagine how much the SRS must cost to operate and while I appreciate that it exists, I’ve personally never contributed a penny to the SRS and I’m not an Austrian taxpayer so I don’t feel like I’m all that well positioned to critique the decisions of those who are trying to keep a centuries-old institution alive. I bought my tickets to two shows when they came to the US several years ago and I bought some souvenir/informational books and dvd’s over the years, so I have contributed monetarily to their survival. I have issues with privatization as I have worked with local governments much of my career and it rarely turns out cheaper. A private company has to get its profit in addition to the operating costs being covered. And they don’t think of it as a national treasure but a quarter by quarter balance sheet where earnings should continue to increase. So somehow you have to make more of what is a unique and non-reproducible product. So you add things, like clinics for professional riders and charge fees to train outsiders, and since these outsiders don’t have the goals of classical horsemanship, but you have to sell a product they will buy for Profits! you change the product from a national treasure to dross. So the institution survives and the horsemanship dies. Again, because it is more important that people have what they want so they fork over the big bucks, than to serve long term goals such as preserving truly educated horsemen and horses in this world. It is the way of the modern world wherein we know the price of everything and the value of nothing, to steal from Oscar Wilde, who probably wouldn’t be a great playwright in this century as you actually have to think about what he says. He wouldn’t be commercial for today’s dumbed down consumers. Your comments on privatization are fair and I’m inclined to agree, but it doesn’t really address the underlying issue of how to keep financial factors from influencing the horsemanship. The SRS costs money to run so it’s always going to have to be beholden to someone whether that is government or shareholders or private donors to a non-profit foundations. I guess the question is which of those is the least evil. And Oscar Wilde wouldn’t be popular today? You took issue on another thread when I talked about people always thinking the world used to be better. I realize this is off topic but I can only conclude that you don’t actually follow modern theatre because there are plenty of great playwrights of this century who make people think. Theatre (as in cinema, literature or any other art form) has always had amusing drivel for the masses as well as true art. I’d vote for Pinter, Letts, Kushner and Stoppard as contemporary playwrights who make you think. The idea that the world is dumbed down is just plain wrong. I think there has always been the “dumbed down” and true art. Human beings don’t change that much. and broad humor and farce are in fact a form of art, but there is just plain ignorant, unthinking pablum and then there is everything else. To go back to theatre, it isn’t just challenged within the genre, live performance on stage, but by the idiot box. And there are some great performances and important stories told through television as well as movies. But in general the level of quality compared to the level of quality still left in theatre, which struggles commercially now, is laughable. (and some of the playwrights that have critical acclaim from Broadway are better known for their screenplays for Hollywood, which were good, but not exactly summer blockbusters, which reinforces my point about commercial success and it not necessarily rewarding the thinking person’s art). So it goes in horsemanship. We are given horsemanship on the level of TMZ as news reporting, regularly, to the point where almost no one can recognize the real deal. Or see the sometimes subtle differences between wrong but flashy and correct. But the horses know. They pay in many ways from just mild frustration and discomfort, to being mentally and physically destroyed. Bad things and bad horsemanship isn’t new to the modern era. The average carriage horse in a big city lasted about four years on the streets. People beat horses when their knowledge failed just as they do today. What we don’t have today are institutions where a repository of knowledge and skill is protected and perfected by lifelong commitment from horsemen, again pardon the sexist word form, but the reality was it used to be men only clubs. One of those institutions now has a new mission, make money no matter what, increase number of performances, get more horses out there to take the strain of the horses of two performances a day, bring in money from other sources, ie, sell out to get big names in the doors and their followers and money, and its all good, we have preserved our priceless treasure. By gutting it, turning it into a sitcom with a laugh track. I am not laughing. Theatre struggles commercially now, not that there aren’t a few playwrights who are critically acclaimed. Some on your list are more know for their Hollywood screenplays. The real point is, but for the neoconservatism and the strange notion that government agencies should turn profits, rather than use taxes to support the common good and important historical and cultural treasures, we wouldn’t be seeing the destruction of an ancient art form. But how many times can I say that profits triumph over any other value in a society today? It has always been somewhat that way, but at least our great Robber Barons such as Cargnegie, Mellon, Vanderbilt, left libraries and university endowments, and art works to museums. Today, we are selling them off, closing them down, rather than pay a penny to keep them open and in good repair. Austria’s military budget in 2008 was $3.975 billion dollars, the SRS posted a net loss of $2 million. The military budget was .9% of GDP. What perverted logic requires Austria to spend almost $4 billion on defense (are the Russians still coming, do they need a large fleet, to build more nuclear missiles) but couldn’t find the money to fund the SRS. And don’t tell me we (US) are worse, we are the world’s worst at overspending on military while our roads, bridges, schools, libraries, etc fall to pieces. We have perverted priorities. Well, perhaps it’s time for a culturally educated person to assume the role of CEO. The speed at which we trade morality and righteousness for money in this century is appalling. What about tradition? Pride? Souls for sale to the highest bidder…. But are we really surprised? I was watching a program about the SRS the other day that was very nice. However, I’ve always, always wondered when we were going to hear about another side to it. I know I shouldn’t be surprised by this, at the end of the day, knowing what people are like, but I was still a little saddened to know that people as part of the horse community could be so callous about something that effects the well being of the horse in such a manner. Sadly its become so prevalent in just about every discipline that people are starting to think its normal 😦 I hope at least a few of the replies shared your view! Ignorance is dangerous to us all, be it horses or mankind. And it is, therefore, always our concern. That’s one of my all-time favorite movies. since I am being a cultural elitist in this thread, I would point out it was a “Ghostly little book” first and a movie second. Mercedes, you know I made strong criticism of strategic changes 3 years ago. The writing was on the wall then. It’s now just a tourist attraction. What’s the formal connection/alliance with Anky? I must have missed that. According to Ulrike Thiel, Anky has been advising. She is considered an expert by the number of International and Olympic wins/medals she holds. Best in the world according to those with the qualifications (judges). Three-four years ago they were NOT riding overbent and a number of their horses were from SRS carring the brands and rhey had rescued some from sosmeplace in Texas that were old school stallions. Have the photos to back it up….. This short poem comes to mind from a long ago book. Robert Frost: one of his finest verses. 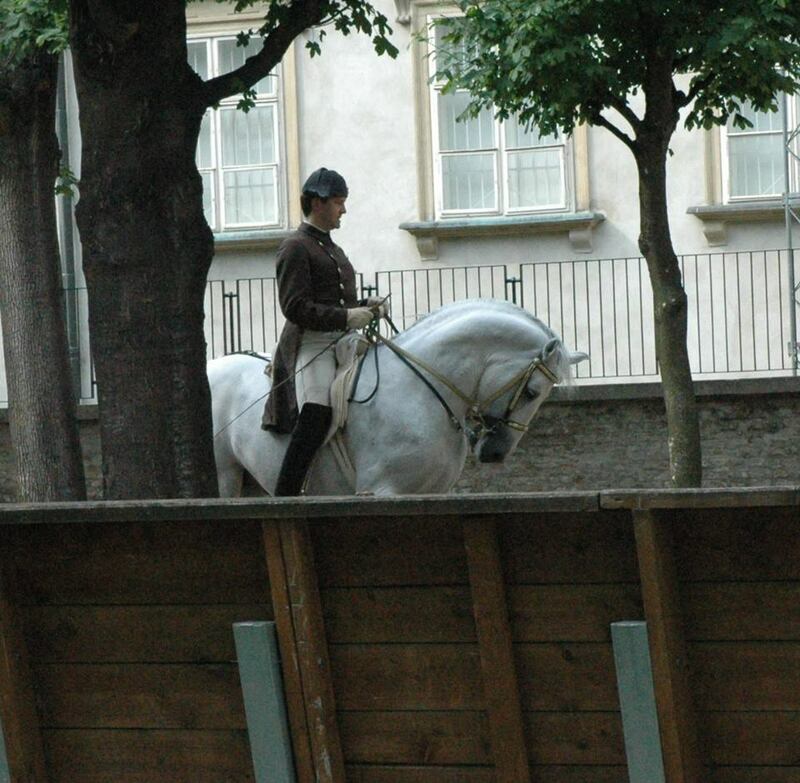 I looked at the SRS website, and found only this about its corporate structure: “At the beginning of 2001 the Spanish Riding School in Vienna and the Federal Stud Piber in Styria were separated from the federal administration and made legally independent whereby the establishment is still wholly owned by the Austrian Federation. The two entities were merged into one legal company and a special Spanish Riding School Act charged the establishment with fulfilling certain duties for the public benefit. These include above all the continuation of the traditional breeding of Lipizzaners, the rearing and provision of prime stallions for the Spanish Riding School and the pursuance and preservation of the High School of Classical Horsemanship.” I am unclear if it is a full-out for-profit corporate entity, or some kind of non-profit or government utility. Either way, “preservation of the High School of Classical Horsemanship” suggests that they shouldn’t be running after rolkur; there are some restrictions on what they can do. Though of course whether anyone has the eyes to see or the will to do anything would be another matter. the government owns the assets, the running of it is done by company management which is expected to turn a profit. The closest idea would be government sponsored entities in the US which would include FDIC (Federal Deposit Insurance Corporation), which insures bank deposits, as a common one most US citizens would have heard of. Banks are charged fees to create an insurance fund, the fees are invested, and if all goes well, they make enough to pay for deposits at failed banks. In the recent economic debacle, too many banks failed at one time and things were a mess. Nevertheless, since the FDIC has a public purpose, they changed the rules to increase amount of insured deposits, and got emergency funding, arranged for assets to by transferred to surviving banks, among other things, to create confidence in ordinary people that their money was still safe in the bank, which is why we didn’t see major bank runs as happened after the market crash in 1929. A lesser known thing they did but which was of major importance, lawyer’s trust accounts were insured to any amount during the crisis. Most major business deals, sales, loans, purchases of properties, have the funds flow in whole or in part through trust accounts. A buyer could deposit a million dollars with the lawyer for a couple days and then it would be paid out to the seller and other people owed money, maybe on a mortgage, and the deal is done. If the bank the lawyers dealt with went under in the middle of a transaction, the money would be gone, and since it exceeded the allowed insured amount, it would be just gone. Commerce was seriously threatened so for a few years at the worst of the crisis, any size deposit in a trust account would be insured and reimbursed. There is a lot government does that is good that can’t be seen from the road. I enjoy reading your comments, and I do learn from what you say. But sometimes I just want to hug you and tell you to cheer up! I am actually not lacking in cheer, I’m just a little blunt and I pay attention to things. As for the bank accounts, I’m a lawyer, it was my job to warn people about what could happen with their money. With closings, the title insurance companies were sending out almost daily warnings of banks we couldn’t close for as they had been put on watch lists or taken over. As the summer of 2008 went on, it was amazing how many banks were failing, including giants like Wachovia. When I reminded the partners at the firm that the savings account in whch they were keeping accumulated earnings of the firm for the year (much of the firm revenue is paid out in annual bonuses not monthly draws to the partners) greatly exceeded the insured amount and they could lose it, you should have seen the look on their faces, absolutely white and shocked, they hadn’t thought about it. Which is my point about a lot that we see but don’t see in horsemanship. We assume all sorts of things are fine when they aren’t. Many times it works out for the best. But being aware never hurts and isn’t actually all that depressing. It gives us an opportunity to be prepared in positive ways instead of being afraid of what might happen. I do understand where you are coming from, either the banking situation or horses, it boils down to common sense. Everybody blamed the banks, but who were the idiots buying $500,000 houses on $30,000 a year? If the horsemanship of the School goes downhill, it will be apparent in the horses, it will show during the performances. Real horsemen will be able to tell the difference. Even IF an idiot with $30k income thought they could afford a $500k home, it’s up to the people at the bank – WHO ARE SUPPOSE TO KNOW BETTER via being an educated professional with ethics and standards to explain why that’s not going to work/can’t happen and then NOT approve such a mortgage. Otherwise what’s the point of all the schooling? What’s the point of being a professional? What’s the point of any of it? Even IF an idiot horse owner thought that rolkur was the way to train a horse because they saw Anky do it and win an Olympic medal, Anky as the professional is the one that’s supposed to know better, have the higher standards, and therefore DO better, just as are every single master rider of the SRS should and just as those overseeing the SRS should. If being a professional means to let the idiots fend for themselves and to benefit financial from them, then that’s a serious problem. Well, banks, being professionals in the business, would be expected to have standards higher than the consumer. Much of commercial law is written that way, one standard for ordinary folks, a higher one for people in a profession or licensed after passing exams as they are professionals. I have a more common sense way of looking at these things, it was a gigantic fraud, so who had the money before and after the complained of activity? In this case, it was never anybody making $30 grand a year, which makes them patsies or victims but not the problem the fraudsters are. And absent cooperative fraud by a bank, people with $30k income weren’t buying $500K houses. If the SRS goes down hill, if the older riders retire or quit in disgust, and the younger ones are left, the oral tradition, the learning by being taught and mentored by the old guys on properly schooled horses already trained by masters, is lost. The older correctly trained horses will die or have to be retired and where will the schoolmaster horses be. Some things that get lost are virtually impossible to replace. That takes us right back to the very first post on this blog. The unacceptable becoming accepted and acceptable. People turning a blind eye to abuse or, worse still, not even seeing it and recognising it. I’ve said for long enough that owning a horse does not imbibe people with knowledge and the massive increase in the size of the market meant that the number of horse owners out stripped the number of horsemen/women and hence the knowledge level, let alone the skills level has been in a constant and precipitous, decline. A lot of owners barely know which end to feed and that you’ve to clear up the muck that comes from the other end. In fact I’d assert that most owners don’t know how to even select a bridle that fits and to put it on properly. They may well get taken for a ride and IF they’ve ever had riding lessons it will be a miracle IF it was from anyone with any real knowledge, credibility, qualification or track record. It sickens me every time I go to any event where there’s horses and because I always see and hear the “kick and pull”. I’ve never yet heard any rider say anything other than “I’ve light hands” but by hell I’ve seen a heck of a lot of riders, at all levels, hauling a horse in the face and heaving it’s head up it’s arse. It’s common place, it’s the norm. It makes me sick! I just need to cheer up and have a hug!